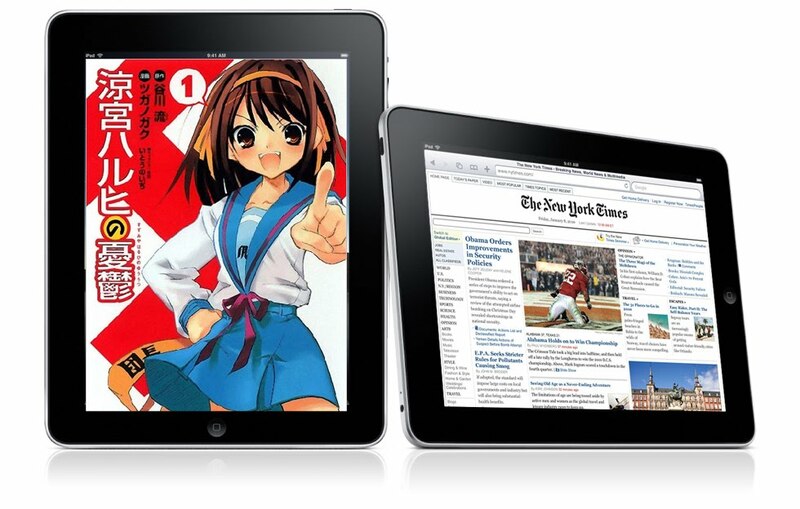 The iPad: Good or Bad for Manga? Of course many have you have heard about the iPad (and god knows this is probably the 1 millionth post about it on the web.) I was busy posting about it on my other personal blog as the information was coming in during the Apple conference. The first thing that comes to our minds when seeing it is; how great would reading manga be on it? Also, there are the Kindle, the Nook, and the Sony Readers out there that for the most part, haven't captured the hearts of manga fans and the lack of manga on them is proof. Now, here's the more important question. Will this be good or bad for the manga industry? The good is that people who might not have been into manga, could start to realize what all the hype is about. On a bad note for the industry, it is bound to reduce the actual paper printing of manga plus it will give more fuel for all those illegal manga viewing sites...even more so than what we already see. The anime and manga industry hopefully will be able to monitize from the iPad and the other readers as well and if they don't, though many fans will be happy to build the pirating free manga sites, less money in the pockets of the content creators means less anime for us to read and watch. Comment what you think this means for manga. Would you be buying the iPad for manga (as well as the other features)? Maybe you are already or planning to use the Nook, Kindle, Sony Readers, etc...or are you just sticking to what most anime fans continue to do and buy stacks and stacks of manga?